David Cox, FAIA is a Founding Principal of cox graae + spack architects and recipient of the 2009 Centennial Award, the highest honor bestowed by the Chapter. Early in his education, in Louis Kahn’s University of Pennsylvania Master Class, David developed an interest in watercolor painting as a form of design representation and artistic expression. In retirement, he now devotes his time and energy to expanding his vast watercolor skill set and exploring opportunities to document the beauty that he encounters daily. In collaboration with his gardener wife Mary Jane, David began an odyssey to arrange and paint the beautiful flowers she grew in their greenhouse and garden. 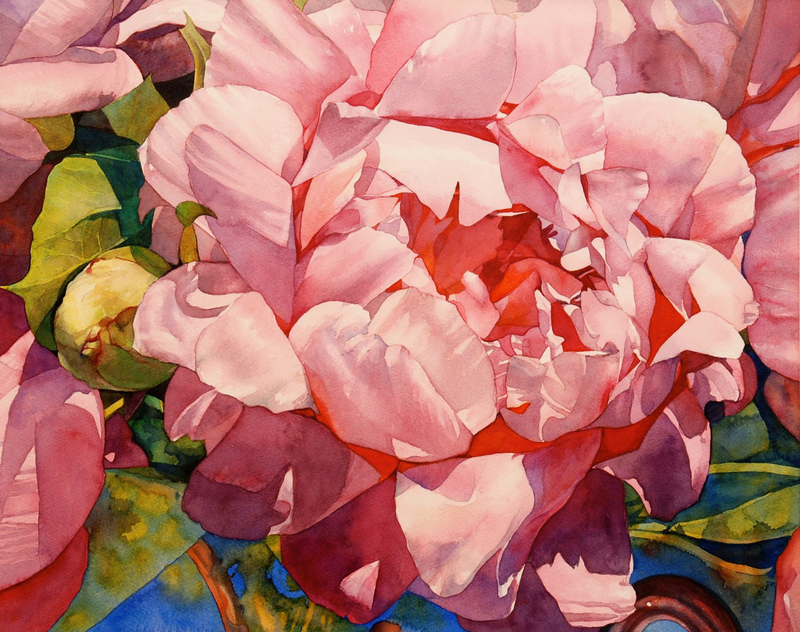 His collection of floral watercolors celebrate light, color, texture, and materials. David paints with transparent colors, adding multiple layers that reveal extraordinary depth and character. Careful planning does not inhibit great creative spontaneity which is revealed as colors bleed and blend naturally on the paper, often within striking shapes and shadowy backgrounds. The collective works are a study in transparency and luminosity, depicting the beauty of the subject matter through light and the delicacy of a medium that captures a full range of variations in value and color, from subtle to striking.